It’s April. We are a third of the way into the year and the marketing message “new year, new you” has turned into “not so new year - same you”. I am not pointing any fingers here. I too fall subject to this cliché. Restrictions cinched too tightly and diets perhaps too extreme and/or too abruptly implemented don’t tend to stick for an extended period of time. Spring brings with it new life and an opportunity, not driven by marketing, to revisit how we are going about our daily lives. Last week we talked about the mind. This week we will be addressing food. How can we softly rebirth our eating habits - both how and what we eat? Train yourself to slow down. Notoriously on the go, New Yorkers are fast. We talk fast, walk fast and eat fast. Why? I am not really sure. While talking and walking like there is a fire burning underneath our feet is fine, inhaling food is a fast track to a belly ache and much worse. Indigestion, gas, burping, nutrient malabsorption, and overeating are just some of the possible deleterious side effects. How long does it take you to finish your meal? Are you sitting down or rushing about or worse yet, looking at some type of screen while you eat? Slow meals = better digestion. They allow digestive juices - saliva and corresponding digestive enzymes - to flow more freely. These juices signal the stomach to secrete more acid which helps with protein synthesis. In addition, the body’s natural satiety signals are given the opportunity to light up and let you know to stop eating before you are stuffed. And really, enjoying food is simply impossible when you are hustling to get it down the hatch! Pause before beginning each meal and express (mentally or verbally) gratitude for all who made your meal possible. It will slow you down and I guarantee it will also make the food taste better. Here is a quick and easy blurb our daughter learned in 1st grade. We say it before each meal. “Thank you gardeners, thank you cooks, bon appetit, now you may eat”. Avoid distractions (tv, computer, phone, reading). Chew chew chew. Go for about 20 chews per bite. Try using harder to manage utensils (chop sticks). Put your utensil down in between bites. Revisit your pantry. Does it need some editing? Perhaps some leaning out of the packaged foods is in order? I am certainly one that is highly conscious of waste. I source and support only sustainably and ethically raised meats, buy locally grown, organic and sustainable vegetables, use vegetable scraps whenever possible, eat nose to tail, etc. BUT, in my opinion, when it comes to packaged, highly manufactured, chemically ridden foods, it makes more sense to waste in order to gain physically and mentally. In other words, purge your kitchen of those things that will not serve you health wise in exchange for food that is alive, wholesome and nutritious. Spring is the perfect time for this type of cleaning! Examine expiration dates. Have some of those canned/packaged foods been collecting dust for some time? Take a look at their expiration dates and purge the pantry of those that have come and gone. Note, some of these foods may not have expiration dates at all but still may be worth trashing. See below. Read all ingredients. Do you spy hidden ingredients you may have not known could be harmful but now (since you’ve been reading out blog) have discovered may not be in alignment with your healthy lifestyle? Some to be aware of are: any vegetable oils (including canola, sunflower, safflower, corn, cottonseed and soy), any soy products, artificial food coloring, foods with unnecessary added sugars (take a look at your balsamic vinegar), any strange chemicals you may not be able to pronounce. Need some smart pantry inventory ideas? Here are some thoughts. What salts are you using? Table salt is highly processed to eliminate minerals and contains additives to prevent clumping. Swap this for a high mineral sea salt. Light Grey Celtic Sea Salt, Redmond Real Sea Salt are couple we love. Love Asian food? Do you use soy sauce? Soy can be an endocrine distruptor and is often genetically modified and highly processed. Try replacing soy sauce with coconut aminos. It is made with coconut tree sap and sea salt, is high in amino acids and tastes great. Take a look at your ketchup. Does it contain high fructose corn syrup or other sugars? Is it organic? Tomatoes are one of the most highly pesticide sprayed with crops. Look for an organic version with no added sugar. Primal Kitchen makes a good one. If you are ambitious - make your own! Are you a mayo person? There are usually 2 distinct camps - mayo lover or mayo hater. Lover? Store bought mayo is generally made with soy or canola oils and preservatives. Again, Primal Kitchen makes a good one. I like to make my own. It takes minutes and tastes SO much better. This is the basic recipe I use. I often use a mild tasting olive oil over the ones suggested. What do you use to sweeten? We all need a sweet treat from time to time! Replace conventional sugar with dates, raw honey, grade b maple syrup and blackstrap molasses. I also like stevia for certain things. My favorite is made by Omica Organics. It is organic and super clean - you can taste the difference. Does your coconut milk have additives in it - sweeteners or gums and fillers? Try making your own - you won’t look back. Message me if you want instructions! Otherwise Native Forest Simple is our go-to. Everyone should have a good quality fish sauce in their pantry. It gives simple dishes complexity and I use it in everything from marinades and sauces to soups and roasts. Many, however are riddled with questionable ingredients. Look for Red Boat. It’s made from a two hundred year, chemical-free artisanal process, is slow aged, preservative and MSG free. I know we’ve talked about seed oils ad nauseam. This is because they are truly toxic. Replace them with extra virgin olive oil, avocado oil, macadamia nut oil, ghee, coconut oil and/or algae oil (sourced from the chestnut tree). Sesame, although it is a seed oil, is super high in antioxidants and is fine to use with low heat. Spring Shift. In the winter months heavier foods, warming foods, hunkering down in your pj’s types of foods are on heavy rotation. It makes sense. It’s cold. It’s dark. Not much aside from root vegetables and perhaps some kale and radicchio are growing in our local gardens. Choosing to cook seasonally and locally to maximize health benefits during the winter months means heavier meals - roasts, soups and stews. Learn how to use these fruits and veggies. Here are a few of my own recipes and some favorites from around the web to get you started! This is a simple spin recipe using wild garlic - or ramps. The ramp season is so short, I make this is big batches and freeze it! Play with the recipe. Substitute pine nuts for a different flavor profile. Give it a micronutrient boost and add spinach or arugula. *Use over grilled vegetables, mix in cauliflower rice, over bread, in pasta, or eat by the spoonful! Wash ramps carefully. Use the leaves alone for a milder flavor, leaves and bulbs for more intensity. Chop the ramps and walnuts roughly. Process ramps, walnuts, and cheese in a food processor. Slowly pour in olive oil until you achieve a pesto consistency. I am always looking for good ways to sneak in a little extra collagen into my diet. This panna cotta is a way to do it. Always use gelatin from a trusted source. We love the Vital Proteins and Further Foods brands. The roasted strawberries and strawberries are also delicious on ice cream, granola, grain-free biscuits…get creative. If you don’t feel like making the panna cotta, plain greek yogurt or labne are also wonderful. Sprinkle some coarsely chopped pistachios over the top for some crunch! 3 tablespoons maple syrup (This will yield subtle sweetness. Add up to double the amount for sweeter results). Sprinkle the gelatin over 2 tablespoons of water in a small bowl or cup and allow to soften. Combine cream, maple syrup, vanilla bean pod and seeds and salt in a medium sauce pan and bring to a simmer over medium heat. Remove from heat and mix in the gelatin. Stir until it fully dissolves. Whisk in the yogurt and divide into 6 ramekins. I use bodega glasses. When ready to serve, run a knife around the edges fo the ramekin or glass and dip the bottoms in hot water for a few seconds. Invert onto a plate or platter and drizzle with roasted rhubarb and strawberries (recipe follows). Preheat the oven to 350 with a rack positioned in the middle of the oven. Mix the strawberries and rhubarb in a large bowl. Whisk together the maple syrup, sweet vermouth, balsamic vinegar and salt in a small bowl and pour over the rhubarb and strawberries. Toss gently until coated. Spread the fruit out on the baking dish in a single layer and drizzle the juices over. Roast for about 40 minutes. The juice will be thick and the rhubarb tender. Transfer to a bowl while warm. It will be good for about a week in the fridge. 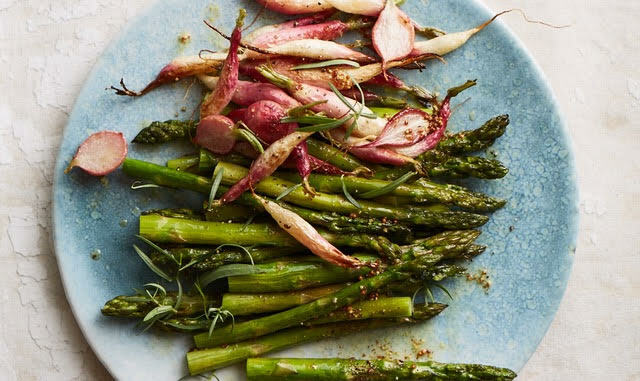 Roasted Asparagus and Radishes with Mustard Tarragon Vinaigrette from Cook Beautiful, Athena Calderone. This recipe takes no time to put together. It tastes fabulous and the colors textures look beautiful on the plate. Fava beans, olive oil and sea salt. What could be better? I love fava beans, but don’t always have the time to prep them. Grilling them whole - and by the way if you don’t have access to a grill, a grill pan works just fine - is such a fun and delicious way to enjoy them. 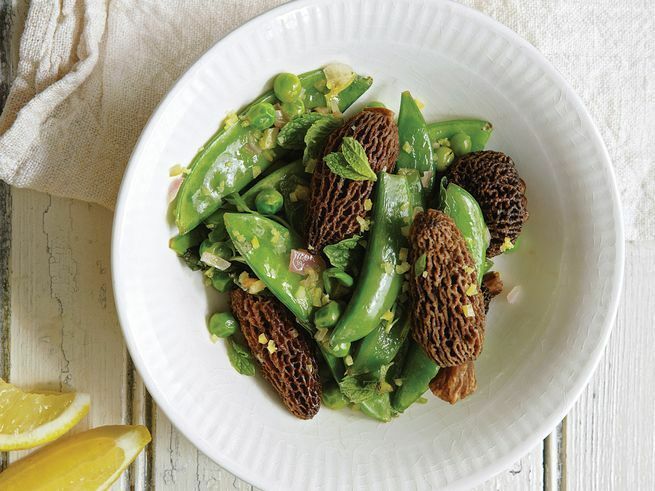 Morels with Mint, Peas and Shallots, from Saveur Magazine. Simple, springy and ready in minutes! If you can’t find preserved lemons, substitute lemon zest. If you try any of these recipes, let me know what you think. Send pictures!